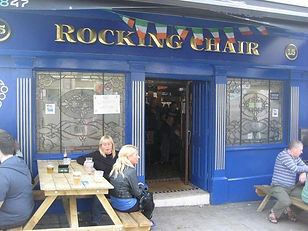 Most of the stuff in my novels comes from my imagination but I owe a fair amount of what I write to a pub called The Rocking Chair where there’s such a variety of characters that you’d need to be brain deaf not to pick up some nuggets. There was one time in particular I want to tell you about. He said the stool didn’t belong to him and I could sit there if I wanted. So I did. I sat beside him and ordered a pint. “What I mean is,” wanting to strangle him, “he put jokes in his books after he heard them from drinkers.” I said all this dead slow. I didn’t care what he thought anymore. “There’s a brilliant one in The Grapes of Wrath,” I told him determinedly. “There’s this country boy about sixteen that’s dead bashful and he’s told by his Da to bring the heifer over to a neighbor’s bull to get her serviced. The neighbor’s daughter Elsie is the only one there and she brings him round to the corral where the bull was and says ‘I know why you’re here Willy. Come on, let the heifer in. This won’t take long.’ And of course poor Willy doesn’t know where to put himself." I sensed from the forehead language that Moleskin had already read this one. It occurred to me – a bit late I suppose – that he probably knew The Grapes of Wrath back to front. But there’s a code of behavior in The Rocking Chair that says it’s bad form to interrupt somebody if they’re in the middle of telling a story no matter if it’s been going for a hundred years. Still, I could tell even without eye contact that this prick was being sorely tested. Now Stevie Walker is tight as a drum and he was standing Moleskin the dearest brandy in the house. It had to be a good joke. It might have been Mole’s but it was mine now. And it was going straight into For I Have Sinned. It’s still there too, nestling near the foot of page 219.
Who said “Good artists borrow. Great writers steal”? THE ANSWER IS UPSIDE DOWN. SEE BELOW. Thanks Nora. Maybe I'll get to Short's sometime! Thanks Claire. I hope your preparation for the big literary event is going well.